of the Edition !_think out-of-the-box_! Politico-economic Readings about the Neo_Wilhelmo-liberalism and its Consequences. What is wrong with the EU? On the one side there is an elite that identifies itself with the lobbycratic EU and that, to a certain extent, has its effect way down into the European peoples through so-called non-governmental organisations. But this way you cannot bind the mass of the people to the lobbycratic EU, in fact, this is only possible through force. Projects like the German agenda 2010, whose implementation leads to trim the mass of the people in line with the market, so that, in the end they can’t help but function in the sense of this ideological guideline of the EU, thus in the sense of the EU ideology. This has nothing to do with democracy but all with lobbycracy. — Consequently, the question arises: How dare anyone call this a democracy when, in fact, all it is is a veritable lobbycracy? becomes apparent in the EU. 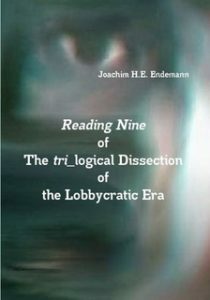 Reading Nine was published in September 2018. Curious? Read the preface here. can be purchased with Lulu.com here.